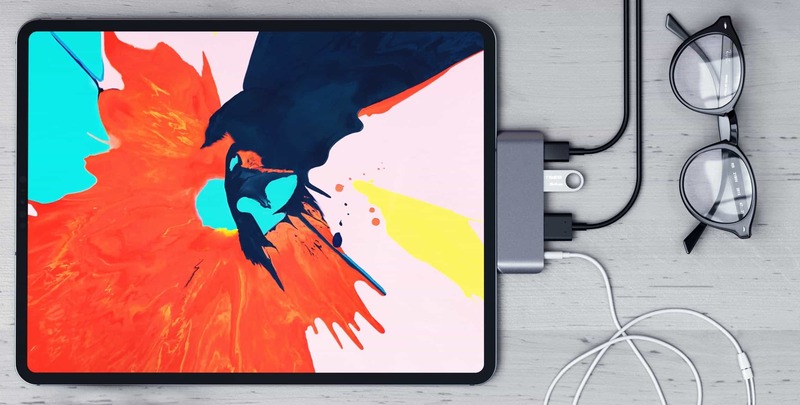 The USB Type-C port in the 2018 iPad Pro can be used with an HDMI adapter, a headset jack, a USB-Type-A adapter and more. With the right hub, all of these can be connected at the same time. The Satechi Mobile Pro Hub stands out because it sits neatly on the edge of the tablet, almost looking like it’s part of the computer. Especially as it comes in either silver or space grey to match the finish of the iPad. It’s 3.25 inches by 1.1 in. by 0.4 inches, and weighs just 1.1 ounces. The Satechi Mobile Pro Hub has a headset jack, HDMI port, USB-A port and a USB-C port. The latest iPad is the first without a 3.5mm headset jack, but this hub includes one. We tested it with a pair of wired headphones and sound quality was quite good. Next to it is an HDMI port that boasts 4K video at 30Hz. iOS still offers limited support for external displays so don’t expect to pull up a second desktop. But you can mirror your iPad Pro screen on any larger display. What’s more, this video port is very useful for playing streaming video on a full TV. We tested it with Amazon Prime and it worked well, displaying the video full-screen. YouTube videos don’t show up full-screen but are otherwise acceptable. The third port in Satechi’s latest hub is USB-A 3.0. This can be used with thumbdrives but here we run into another iOS limitation: images and video can be transferred from the drive to the iPad Pro but nothing else. And the files have to start out in the right folder. Still, other USB-A accessories perform as expected. You can use a wired keyboard, and we even tested the Apple USB Ethernet Adapter ($29) without a hitch. There’s no mouse support in iOS 12, unfortunately. The final port is USB-C so you can keep your tablet charged while using all those other accessories. 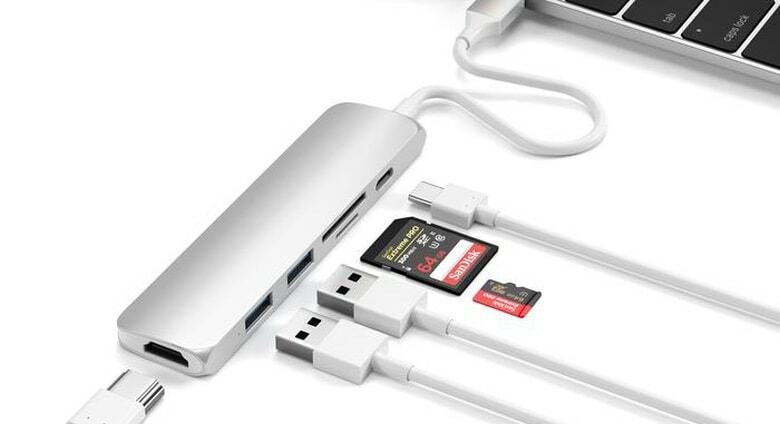 It’s power only though, so you can’t hook up other USB-C peripherals. And it has another drawback: Satechi says that its accessory offers Power Delivery 3.0 but in our tests it charged the iPad Pro quite slowly. Over multiple tries, recharging the iPad Pro through the Mobile Pro Hub for 20 minutes resulted in the battery increasing by just 1 percent. Under the same conditions but without the hub the tablet’s battery went up 15 percent 20 mins. Still, power flows fast enough that we can use the iPad with power coming in through the hub without the tablet’s battery actually dropping, even with the backlight at 100 percent. It’s not necessary for the hub to be plugged into the wall for accessories to function; the tablet alone can provide plenty of current. And in a potentially handy trick, the hub sends power to the USB-A port whenever it’s plugged into a wall, even if when it’s not connected to the iPad. So it can be used as a USB-C to USB-A adapter to recharge other devices. An important consideration is that there’s a lot of strain on the iPad Pro’s USB-C port when something is plugged into all four of the hub’s ports while the tablet is propped up with the Apple Smart Keyboard Folio ($179 or $199) or other keyboard case,. We had no problems in the weeks we tested this hub but that doesn’t mean there won‘t be issues after several months. Also, keep in mind that a bulky case might not have a wide enough opening for the USB-C port for the Mobile Pro Hub to be able to make a connection. It needs to be right next to the iPad to work. The Mobile Pro Hub was designed for the newest iPad Pro, but the tablet works just as well with any USB-C hub. That includes the Satechi’s Multi-Port Adapter V2. It was created with MacBooks in mind but it expands the capabilities of Apple’s tablet as well. It’s not as small as the Mobile Pro Hub, coming in at 4.7 inches by 1.2 in. by 0.35 in. That’s not counting the 6.0 inch connecting cable which essentially doubles the size. The weight is 1.8 ounces. It comes in gold, silver, and space grey to match your computer. The Satechi Multi-Port Adapter V2 was designed for a MacBook but works with iPad Pro too. Like Satechi’s smaller hub, the Multi-Port Adapter V2 has an HDMI port, a USB-A port and a USB-C power port. We tested these and they worked just like their equivalents on the other hub. But this accessory doesn’t stop there. A major difference in this model is the addition of microSD and SD card readers. These are quite handy for people who want to import images or video taken with other cameras. We tested to be sure and both slots performed flawlessly. But iOS isn’t capable of doing anything else with external storage. Files can’t be uploaded, for example. There’s also a second USB-A port in this Satechi hub, handy if you want to plug in a thumbdrive while another peripheral is already connected, like a keyboard. Still, the potential functionality is limited because iOS can’t copy files between USB drives. Missing from the Multi-Port Adapter V2 is a headset jack, presumably because laptops already have one. But the latest iPad doesn’t so tablet users might prefer the Mobile Pro Hub. Also missing is an Ethernet adapter. This wouldn’t fit into a slim accessory like this one, though. And these aren’t as necessary as they once were. Anyone who has to have one should consider investing in the Apple USB Ethernet Adapter ($29) — we tested this USB-A peripheral with both hubs and it performed perfectly. The cable on this Satechi hub helps take its weight off the tablet’s USB-C hub. Even so, it’s still a bit awkward to use. It’s designed to be connected to a notebook sitting on a flat surface not dangling off the side of an iPad. The USB-C port is a dramatic improvement in the 2018 iPad Pro, as demonstrated by the Satechi Alumiunium Type-C Mobile Pro Hub. The adapters need to attach the most common types of accessories fit into a surprisingly small package. At $59.99, it’s a bargain compared to buying adapters individually. The Belkin USB-C to HDMI adapter alone is $49.95, for example. Or the Apple USB-C Digital AV Multiport Adapter is $69.00 but offers fewer ports. The Satechi Slim Aluminum Type-C Multi-Port Adapter V2 might be best for those who intend to share a hub between their tablet and MacBook. That said, it’s great for anyone who wants to transfer pictures off an SD/microSD card to their iPad. The cost is $69.99. Again, a good price considering how much individual adapters will set you back. The Apple USB-C SD Card Reader by itself is $39, for instance.